Three women leaders are going to hog the limelight in the ensuing Lok Sabha polls. They are BSP chief Mayawati, West Bengal chief minister Mamata Banerjee, and the latest entry into politics, Priyanka Gandhi Vadra. Of the three, the first two are established women leaders and have been in politics for a long time whereas Priyanka is a novice to active politics though she has helped her mother and brother in nursing their constituencies and also been a backroom girl in Congress politics. There are three types of women politicians. 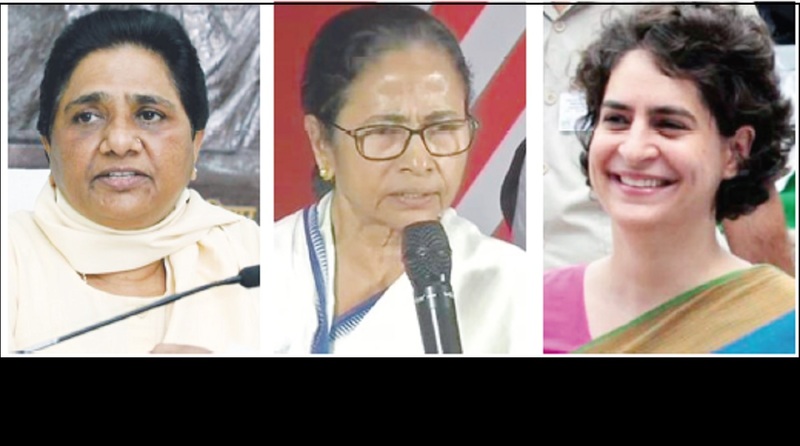 The first comes from political families (Priyanka), the second rises because of a mentor (Mayawati) and the third who comes up on her own (Mamata) and the three leaders represent the three varieties. Priynaka is an X factor. She might hog the limelight in the coming days because she is news. The Congress Party expects her to wave the magic wand but can she succeed? She has taken a political risk by entering politics at this time with her husband Robert Vadra as baggage. Active politics is different and her every action will be scrutinised and judged by the public under a microscope. She has many positives in her favour. She is young with a clean slate, pretty, articulate, and charismatic with quick political reflexes and above all she is from the Gandhi family. The minus point is that she has never been known to work for even a social cause and never held any position in politics or government and has not served as an MP or MLA or even a member of a Municipal Corporation so far. The Gandhi name alone will not get her votes. It is too early to predict her success or failure. If the Congress does well in eastern U.P of which she has been put in charge, then she can take credit as a vote catcher, though there is no doubt that she is a crowd puller and a star campaigner. Mamata is a tried and tested leader with no family backing or mentor. Her sweet victory of throwing out the Left in West Bengal in 2011 after 33 years of continuous rule makes her a giant politician. She proved her credentials a second time by winning the state in 2016. In the past eight years she has finished off the Left and the Congress and is trying to block the expansion of the BJP in her backyard. Her success has made her ambitious, as she is now dreaming of becoming the prime minister and ahead of that to anchor the opposition. She is not only a crowd puller but also a vote catcher. Politically astute, she can take decisions in a second like she did last week on supporting her police commissioner Rajeev Kumar against the CBI. She sat on dharna at Metro channel in Kolkata’s Esplanade area where she had fasted during the Singur/ Nandigram agitation for 41 days. She has been a central minister thrice. On the minus side, Mamata is authoritarian and an impulsive leader. She is seen as politically opportunistic and undependable as she has been an ally of both the UPA and NDA. The third woman leader is the inimitable BSP chief Mayawati. She has been the chief minister of Uttar Pradesh four times. Though she did not get any seats in the 2014 polls, she got 22 per cent vote share. Her Dalit vote bank is intact. Her decision to go for an alliance with the Samajwadi party in the ensuing elections is a master stroke and has given the BJP jitters as it is bound to lose some 40 or 50 seats if the SP-BSP alliance succeeds. She is indeed a symbolic figure of social mobility. Her life is a compelling story of a woman who overcame the problems against caste, gender and social stigma. The late Kanshiram picked her up and groomed her as a leader. It was he who made her the chief minister for the first time in 1995 as the BSP-BJP coalition leader. Her social engineering in 2007 won her handsome seats. From a woman with oily hair and shabby clothes in the 1980s, today she has turned into a leader with flashy diamonds and colourful salwar-kurta. Like Mamata, she too has prime ministerial dreams and is often touted as the candidate by her party. She has cultivated the image of an iron lady over her four decades of politics. Her weapon against her political enemies was that they were trying to put down a ‘Dalit ki beti.” She speaks directly to her voters who come to her meetings carrying their own food and wait patiently to hear their leader. Her party has expanded to other states like Rajasthan, Karnataka, Madhya Pradesh, Punjab and Maharashtra. She is a loner. Like Mamata, she too is authoritarian, unpredictable, opportunistic and unscrupulous. She is politically vulnerable because of corruption cases. Will the voters favour the three charismatic women leaders? It all depends on a lot of factors including issues, arithmetic and chemistry. If Dame Luck smiles on them, can they be stopped?